Here’s another one of those films I knew nothing about prior to my initial viewing. It was just a name on my list, it sat there for quite a while as I tried to source a DVD. The sense of anticipation was palpable when I finally bagged a copy and the complaining DVD player fired up. My dear old DVD player. We’ve travelled the world together. It’s been sickly of late and has very nearly been chucked. I don’t suffer from the affliction of attachment to inanimate objects….in general…..but this DVD player and I have some history. For some reason it’s starting playing ball again over the last few days and so it is that it works first time. In my experience this means only one thing. It’s going to explode and set fire to the house, and potentially the entire street, within minutes. As I eye the DVD player warily the film starts. I cross my fingers hoping for a goodie. I’m instantly confronted with an aerial shot of the Thiepval Memorial. What a thing of beauty. I took my parents, the Mrs and our daughter a couple of years ago. We stood in that small, unassuming cemetery and paid our respects to the Unknown Soldiers of the Commonwealth and French Armies. The slight downward slope opening up the view of the rolling countryside below. As we were hemmed in by tall trees that shielded the strengthening wind to a cooling breeze, we read a few of the thousands upon thousands of names on the high walls of Lutyen’s memorial. It left me with a sense for the gravity and scale of the loss. That is a trip I will never forget. 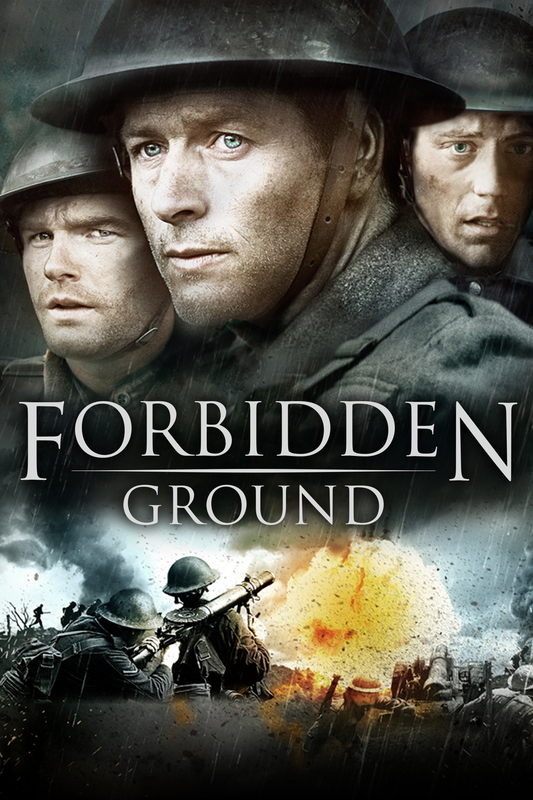 Forbidden Ground (or ‘Battle Ground’ in the States) is the story of three Commonwealth soldiers lost in no man’s land after a failed attack. 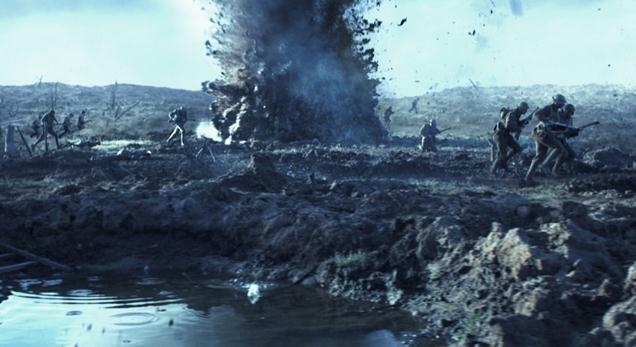 The common story of a botched pre-attack barrage coupled with an apathetic, misguided commanding officer leading to the deaths of swathes of Commonwealth soldiers cut to ribbons by the withering fire from entrenched German machine gunners or blown to pieces by their well taped artillery. My first point to make about ‘Forbidden Ground’ is that it doesn’t cover anything particularly new, but what it does cover is done well. From the initial trench scenes thick with the requisite amount of claustrophobia and stink to the attack through no man’s land where the attackers slowly diminish falling face first into the cloying mud or disappearing into red mist, it’s clear this is going to be visually pleasing in terms of accuracy and sentiment. It’s also clear there’s not much money being thrown around. The cash they did have has been well spent. The use of CGI is minimal and unobtrusive. Whereas ‘Canakkale 1915’ sledgehammered me with armadas of fast moving (sideways) battleships ‘Forbidden Ground’ massages my shoulders and augments the scenes with spits of gunfire or the odd explosion. The technique for money saving is clear. Keep all the camera work close up and focus on the story. 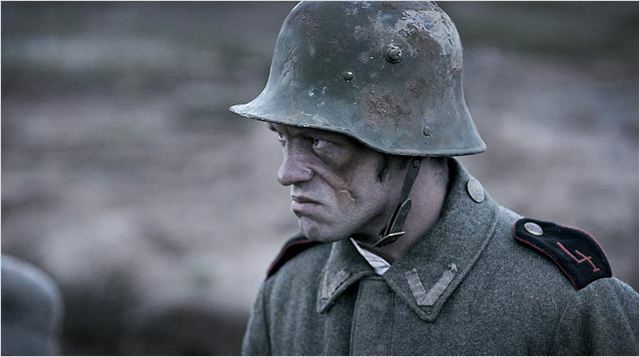 The majority of the film revolves around the three protagonists and their attempts to save themselves while a group of Germans, led by a (stereotypical) despotic, facially scarred and deeply angry Commander, try their very best to kill them. One of them has a leg blown off and the occasional close ups of his wound and their attempts to stem the flow of blood add a wince factor to the film. As an impromptu tourniquet is yanked tight around the wound my face contorted like I’d just bitten into a lemon. Likewise, every time it was dragged through the dirt or splashed down into a filth filled shell-hole I felt myself feeling physically sick. There are occasion cuts to the second story in the UK as the pregnant wife of one of the soldiers (pregnant by some other chap) attempts to procure an abortion at a time when such things were illegal. This part is a good counterpart and chance to breath after all the blood and guts at the front but does it add anything to the main story? Not really, it just feels like filler. 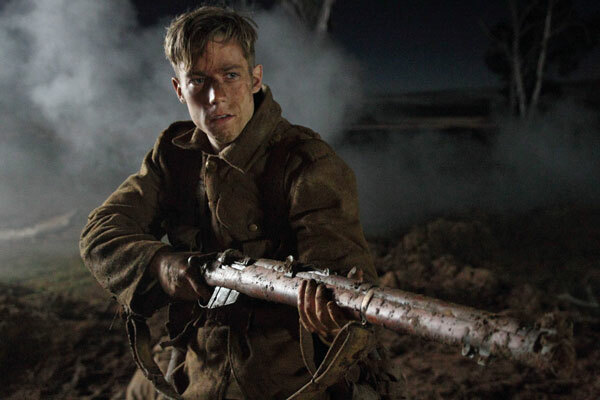 As I said there’s nothing new here, the story is standard Great War Film stuff but what they’ve produced is a genuinely good film with characters I can believe in and a story that must’ve played out with various outcomes during the entire course of the conflict. It’s been produced with a respect for the subject matter and those it seeks to portray. My only complaint really are the deeply stereotypical British Officer and his ‘Evil’ German counterpart. Both of them stick out like sore thumbs in what is otherwise a strong set of characters with nuances, failings and strengths. Also (and this is nit-picking) the accents are a bit iffy. The reasons the accents sound a bit off to my Northern Hemisphere ears is that this film was produced and filmed in Australia. Right at the end it states ‘Made in Sydney, Dubbo and Canberra’. If I were wearing a hat I’d take it off at this point because I have been successfully transported to the Western Front and all its’ mire and filth when I was actually sitting in tropical, bone dry and stifling Australia all the time. Oh yeah, I remembered another thing I didn’t like about it. There are basically three endings for the film. On their own they each have merit, except maybe the last one. The writers needed to grow a pair and choose just one of these as the ending. Trotting them out one after the other just drags things out a bit and makes the ending overly saccharine. I’ll end there. This is a good film, knocked up on no budget with good performances and a strong story. Its imperfections are piffling compared with its’ many positives. Australia, you’ve done it again. Clicky Clicky to buy yourself a copy. I loved that DVD player. Why (i.e. “how”?) 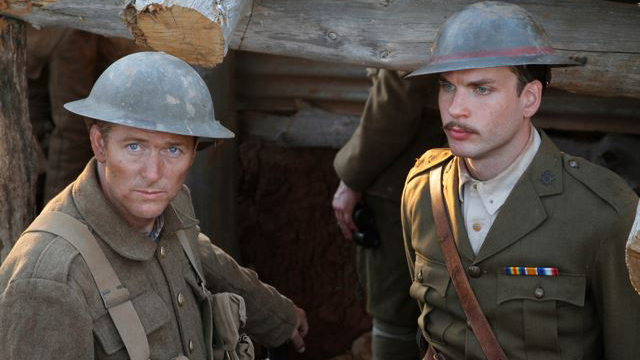 is the soldier in the still wearing his 3 ribbons in 1916? And I won’t ask why they’re back to front….